If you want your organisation to engage better with stakeholders take some time to understand why. This blog explores three levels of commitment to stakeholder engagement – self-interest, enlightened self-interest and altruism. As with any classification system, these levels are arbitrary and could be endlessly debated – they are simply offered to stimulate thinking about your motives and drivers. Implementing an initiative, such as stakeholder engagement is more likely to be successful if there is congruence between your thoughts and your actions. 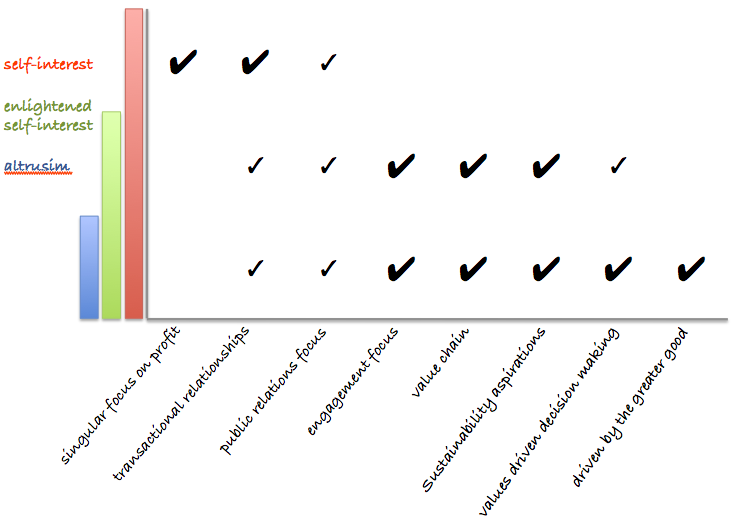 According to Sue Knight, our behaviours (what we say and do) are driven by the sub-surface factors of purpose, identity, beliefs, values and capabilities (see The heart of sustainability for more detail). So, for example, if you are just desperate to make money, and for your business to survive, your behaviours will reflect this. Self-interest: These are businesses that want to make money and survive – and that includes most business. But those who pursue this solely, will use any means within their ethical and legal boundaries (most of the time). Broader considerations are sublimated to the profit motive. Enlightened self-interest: Businesses that want to make money and be more sustainable attempt to operate in ways that are not just financially sustainable, but also factor in the well-being of others and care of the environment. They look for synergy in these aspirations. Altruism: These organisations are either established with altruistic missions or develop those as their owners turn from business-success to deeper motivations. In this diagram, these levels are presented in a matrix. Notice that the self-interested motive persists in the other two levels – all organisations want to survive. And enlightened self-interest is compatible with altruism – successful businesses have more resources to give. Following blogs will look at examples of each of these levels of business and the behaviours they engender. Singular focus on profit: Our primary motivation is to contribute to a better world. Transactional relationships: The success of our organisation depends on our ability to create great relationships with our stakeholders. Public relations focus: Good public relations are important to us, but more important is open and transparent engagement. Engagement focus: We see engagement as a core organisational competency that underpins our success. Value chain: We work with staff and suppliers to add value for both parties, valuing long-term relationships. Sustainability aspirations: We are driven to maximise the triple-bottom line, for prosperity, people and the planet. Values driven decision-making: Our values guide our decision-making – if an opportunity doesn’t sit well with our higher values, we won’t pursue it. Driven by the greater-good: Our primary motivator is to contribute to the well-being of humanity. 0 to 8: At the low range, your organisation has a singular focus on profit, if you are at the higher, perhaps your organisation is on the cusp of enlightened self-interest. 8 to 16: Your organisation shows signs of enlightened self-interest and could well be on a trajectory towards sustainability. 16 to 24: Your organisation is manifesting altruism. There are clear examples of organisations in each of these three categories. We will look at them more closely in following blog posts. And I would love to hear of your organisation’s journey towards altruism. This entry was posted in Stakeholder engagement, Sustainability and tagged altruism, enlightened self interest, Stakeholder engagement, stakeholder engagement survey, sustainable, value chain by Peter Bruce-iri. Bookmark the permalink.